Did We Mate Or Murder Neanderthals? This article was written by Jane Bosveld of Discover. Aiming his crossbow, Steven Churchill leaves no more than a two-inch gap between the freshly killed pig and the tip of his spear. His weapon of choice is a bamboo rod attached to a sharpened stone, modeled after the killing tools wielded by early modern humans some 50,000 years ago, when they cohabited in Eurasia with their large-boned relatives, the Neanderthals. Churchill, an evolutionary anthropologist at Duke University, is doing an experiment to see if a spear thrown by an early modern human might have killed Shanidar 3, a roughly 40-year-old Neanderthal male whose remains were uncovered in the 1950s in Shanidar Cave in northeastern Iraq. Anthropologists have long debated about a penetrating wound seen in Shanidar 3's rib cage: Was he injured by another Neanderthal in a fight-or was it an early modern human who went after him? "Anyone who works on the ribs of Shanidar 3 wonders about this," Churchill says. The possibility that early humans attacked, killed, and drove small bands of Neanderthals to extinction has intrigued anthropologists and fascinated the public ever since Neanderthal bones were first studied in the mid-19th century. At first naturalists were not sure what to make of the funny-looking humanlike bones. But with publication of Darwin's On the Origin of Species, the idea that the bones were from a species closely related to us began to make sense. Eventually scientists recognized that Neanderthals were an extinct species that shared a common ancestor (probably Homo heidel¬bergensis) with Homo sapiens. For thousands of years, Neanderthals were the only hominids living in Europe and parts of Asia. Then, around 50,000 years ago, early modern humans migrated into Europe from Africa. By 28,000 to 30,000 years ago, the Neanderthals had disappeared. For more than a century after their discovery, our robust relatives were depicted as dumb brutes, but the Neanderthals have had something of a face-lift in recent years. They are now considered to have been intelligent (as smart as early modern humans, some anthropologists think), perhaps red-haired and pale-skinned, and capable of speech. They might even have created their own language. The more we learn about Neanderthals, the more familiar they seem. But one deep mystery remains: Whatever happened to them, and why did they disappear? There are many theories but not a lot of proof. That is why Churchill's study of Shanidar 3 and another study published this year about humans cannibalizing Neanderthals are essential. They add a few details to the shadowy picture we have of our long-lost cousins. Anthropologists have many interpretations. Maybe our direct ancestors and Neanderthals largely coexisted (as did many other overlapping hominid species before them), with occasional bouts of quasi-tribal warfare that ebbed and flowed. Then again, maybe humans relentlessly drove Neanderthals into extinction. Right now these are just possibilities. Only the bones and artifacts can tell what really happened. Churchill's curiosity about the fate of Shanidar 3 led him to try re-creating the sharp, deep scratch in the left ninth rib of this hapless Neanderthal. This strategy actually came from Churchill's colleague John Shea, a paleoanthropologist at Stony Brook University in New York who reconstructs the behavior of prehistoric peoples by analyzing their stone tools. To understand how stone points are worn down when piercing flesh and bone, Shea had run a set of experiments, stabbing goat carcasses and then noting the damage to the tools. Churchill hoped to compare the cuts on Shea's goat bones to the mark on Shanidar 3's rib. Unfortunately, the goat bones were so damaged by the blows that "it was impossible to analyze them," he says. He concluded that he would have to do his own experiments to replicate the physics of Shanidar 3's prehistoric wound. Neanderthals were the power-thrusters of the Paleolithic world, driving their heavy spears with great kinetic energy and momentum into bison, boar, and deer. If Shanidar 3 had been injured by such a thrust, it would suggest that he had gotten into a fight with another Neanderthal, or perhaps that he had been hurt in a hunting accident. But if the wound had resulted from a lighter spear-from a projectile deftly thrown at a distance, with less momentum and energy-the attacker was most likely human. There is no evidence whatsoever that Neanderthals ever used throwing spears, Churchill says. After inflicting a set of sample wounds on pig bones, which are close in terms of size and shape to those of Neanderthals (and which were easily obtained from a nearby slaughterhouse), Churchill and his team of students spent an evening cleaning the bones by boiling them in hot water and Biz, a laundry detergent containing enzymes that are, Churchill says, "really good at breaking down proteins." The process revealed signs of damage to the pig bones similar to those seen in Shanidar 3. "We cannot definitively rule out accidental wounding, attack with a knife, or attack with a hand-delivered, heavy Neanderthal spear," Churchill says. "But Shanidar 3's wound is most consistent with injury from a lightweight, long-range projectile weapon." In other words, a human probably did it. The spearing of Shanidar 3 documents only the act of one individual against another. Paleontologist Fernando Ramirez Rossi discovered something far more nefarious while comparing the jawbones of a Neanderthal child and an early modern human last year at the Institute of Human Paleontology in Paris. Both mandibles, dating from about 30,000 years ago, had been excavated from a cave called Les Rois in southwestern France. Finding Neanderthal bones mixed in with human bones is in itself significant because it shows that early humans and Neanderthals truly did meet face-to-face. Ramirez Rozzi thinks that some of the encounters may have been peaceful, but this one apparently was not. The Neanderthal jawbone exhibits cut marks made by a stone tool that mirrors those seen on a number of reindeer jawbones found nearby. The marks are distinctive indicators of slaughtering, including repeated indentations in the bone where the tongues were cut out. "It is clear that early humans were eating Neanderthals," Ramirez Rozzi says. The cut marks are also similar to ones noted a decade earlier on deer and Neanderthal bones found at Moula-Guercy, a Paleolithic site in southeastern France near the Rhone River. The cannibals in that instance, though, were other Neanderthals, not early humans. Anthropologists suspect that there was never a huge population of Neander¬thals, although we do not have enough evidence yet to know how many lived at any given time. That is why some scientists doubt there were frequent run-ins between Neanderthals and humans. But Ramirez Rozzi disagrees. He thinks that Neanderthals and early humans met "on many occasions" and that some of those meetings were violent. "We can also say that, as with violent encounters between different peoples, on one of those violent meetings the loser-the Neanderthal-was eaten by the winner," he says. The proven proximity has fostered a debate over whether humans and Neander¬thals might have mated with each other as well. Ramirez Rozzi classifies Neanderthals as a separate species, Homo neanderthalensis, and therefore suspects that close relationships with early humans were rare. "I think early modern humans viewed Neanderthals as a different group, as 'the other,'" he says. But Svante Pääbo who leads the Neanderthal Genome Project at the Max Planck Institute in Germany, painstakingly sequenced samples of Neanderthal DNA and found little evidence of their genes in us. His result implies that there was minimal interbreeding. "But so far we have only been able to see if humans have any genes from Neanderthals," he says. "We are now starting to look to see if there are genes in Neanderthals that came from modern humans." 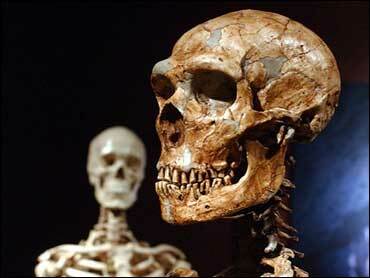 Most anthropologists interpret the disappearance of the Neanderthals some 30,000 years ago as a true extinction. They are just not sure why it occurred. "My gut feeling," says Neanderthal expert Francesco d'Errico, director of the National Center for Scientific Research in France, "is that the Neanderthal extinction went on for several millennia and was modulated, but not determined, by climatic changes." Indeed, the era between 65,000 and 25,000 years ago, toward the end of the Pa¬leo¬lithic, was a time of major volcanic eruptions, along with extremes of climate that included rapid shifts in temperature accompanied by alternately creeping and contracting glaciers across many regions of Eurasia. "This put a lot of stress on plant and animal life," says archaeologist Steve Kuhn, of the University of Arizona. "Habitats were shrinking. Some researchers believe that everything was changing faster than the Neanderthals' capacity to adjust to them." There also probably were not very many Neanderthals, and their small population may have played a role in their extinction. "Rare animals can be wiped out by climatic stress and competition more easily than animals that are common," Kuhn says. Kuhn and his colleague and spouse, archaeologist Mary Stiner, also suggest that the Neanderthals' social structure put them at risk. Unlike early human hunter-gatherer groups, Neanderthals concentrated almost entirely on hunting big game, as evidenced by the abundance of large animal bones in Neanderthal archaeological sites. At these sites there is also an absence of technology for grinding or crushing plant foods to extract their nutrients, which is essential to the lifestyle of foragers. "They engaged their entire group-men, women and children-in hunting big game," Kuhn says. Involving the whole tribe in hunting worked well until the climate changed and competition showed up in the form of early humans. Homo sapiens's division of labor allowed women and children to focus on small game and gathering while men went after the larger prey. In tough times, Kuhn argues, this diversified diet gave early humans a survival edge. It is impossible to know exactly how major a role human aggression played in the Neanderthals' disappearance. The groups undoubtedly competed for resources, though, and evidently humans sometimes attacked or even ate Neanderthals. The death of Shanidar 3 may thus have foreshadowed the fate of his entire species. After a human threw a spear into his chest, Shanidar 3 lived at least another two weeks with the spearhead (if not the whole spear) stuck in his ribs. At the time of his death, the gouge in his bone had started to heal. He was one tough guy. Archaeologists found him some 50,000 years later in the cave in Iraq's Zagros Mountains, buried under the rubble of a collapsed ceiling. There is no way to tell whether he died from his wound or from being trapped under the rock. Like so much else about our wayward cousins, the final cause of Shanidar 3's death remains a mystery.